Welcome to my second 'Ooh, Look what I Won' post. In these posts, I'll be showing you any giveaway prizes I've recently been lucky enough to win. I'm super excited to be sharing another great giveaway win with you today. This time, I won two gorgeous Maybelline Color Sensational Vivids Lipsticks from the lovely Laura Galloway. I highly recommend checking out her brilliant YouTube beauty channel and her lovely beauty blog (links can be found at the bottom of this post). Seriously, just how cute is this little card that Laura included? It also contained a really sweet thank you message for being a subscriber and supporting her YouTube Channel. Well Laura, I want to say thank you to you for the lovely card, the lipsticks and for all of the enjoyment myself and no doubt many others get out of watching your amazing beauty channel and reading your lovely beauty blog. The two lipsticks I won are from the Maybelline Color Sensational Vivids Line which launched here in the UK a few months ago. I believe they have been out in America for longer and were a huge hit over there. When they were first released in the UK, they sold out in a lot of places pretty quickly so I think they've been a big hit over here too and I'm so pleased I've been given the opportunity to try them! 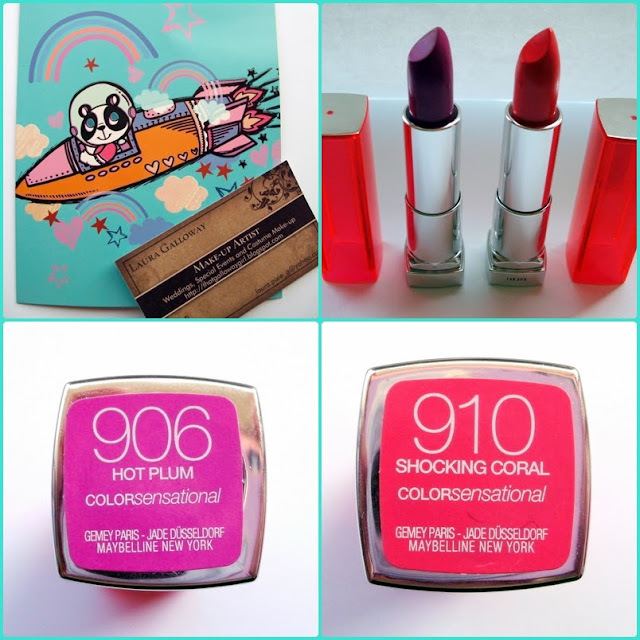 The two shades I won were 906 Hot Plum and 910 Shocking Coral. Hot Plum is a actually a pinky based purple colour which looks much lighter swatched than it does in the bullet. It actually seems like it could be a really wearable colour and the pigmentation is incredible - this swatch actually stained my hand! Shocking Coral doesn't actually look all that shocking! It's just a really nice, yellow toned bright pinky red colour. Again, it seems to swatch more lighter in colour than you would think from looking at the lipstick bullet. But the pigmentation is super and the texture feels creamy and like it could even be quite hydrating! So, there are my two new gorgeous lipsticks courtesy of the lovely Laura Galloway. Laura blogs about all things beauty related at That Galloway Girl and her Youtube Channel is also can be found at Thatgallowaygirl. She recently did an updated makeup collection and storage video and WOW, I love her entire collection! I'll post the video below in case you want to drool over her entire amazing makeup collection. Check out Thatgallowaygirl on Youtube! Have you tried any shades from the Maybelline Color Sensational Vivids Lipstick line yet?